Discussion in 'Android Devices' started by mmpotash, Apr 25, 2012. 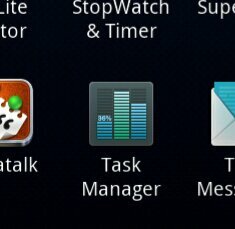 My Droid Charge has a feature where I hold the "Home" button down and it brings up the task manager. This gives me the ability to close programs, which allows my battery to last all day. How can I accomplish this with the Bionic? Go to ... Menu | Settings |Applications | Running Services and select the task of interest. You can then choose Stop. For my Charge I needed only 2 button pushes to close all the apps at once. I generally suggest ignoring task managers, because they do not help, but if you want to use one, that's a good one. It may be the pro version that has the widget (I have the pro version) but you can install the free one and see. I use this app just to see how much RAM is free at any given time (out of curiosity) and, maybe once in the last year, I have closed an app with it that was consuming a lot of CPU. I have read on the forums that it kills your battery faster when killing tasks because after update 2.2.3 (i think thats the one) it gave android the ability to decide which should run and which shouldnt. It may be on there but its not really running. In the case for me I need to kill them because I have the D1 and those programs in the task manager REALLY bog down my phone unless I kill them. kinda a lose lose for me (lose battery life or lose ability to run apps) but with the bionic you should be fine. If you really need it. The Bionic has it's own Task Manager as an app. You can set programs to close after two minutes when phone goes to sleep. I use the Task Manager too and it works like a charm. Just don't use it on apps like Pandora.